NEW YORK, Jun 12 2017 (IPS) - Global food extremes of chronic undernourishment and obesity have brought about a bipolar world of hundreds of millions of underfed and overfed people. Of the world’s population of 7.5 billion the proportions suffering from chronic undernourishment and those afflicted by obesity are similar, approximately 11 percent or together about 1.6 billion people. However, as with most global averages, the levels of both chronic undernourishment and obesity vary enormously among regions and across and within countries. Various indicators may be used to determine the levels of chronic undernourishment, including caloric intake, poverty, mortality/morbidity, weight and height measurements, child wasting and child stunting as well as composite indexes. In this analysis, the focus is on undernourishment, defined as a person not able to acquire enough food to meet the daily minimum dietary energy requirements over a period of one year. Almost all of the chronically undernourished, more than 800 million people, live in developing countries, primarily in Africa and Asia. The reminder of the chronically undernourished, about 15 million people, reside in developed countries. The populations of some 40 countries are facing serious food shortages. 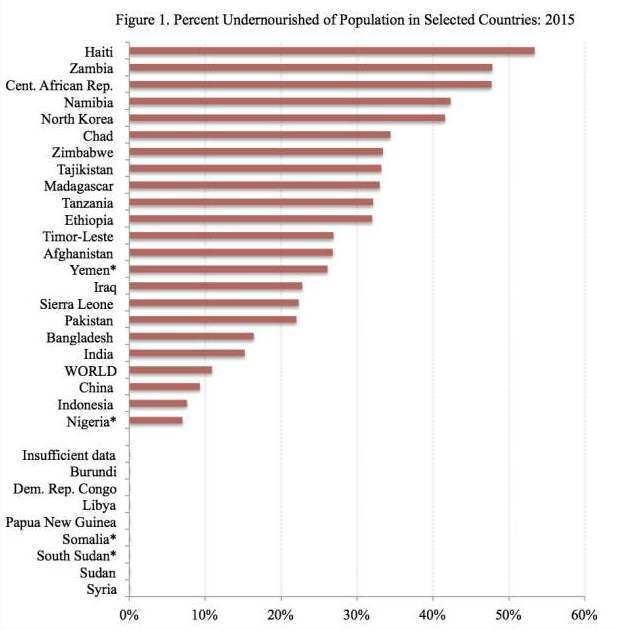 In a dozen of those countries no less than one-third of the population are suffering from undernourishment, including Haiti, Zambia, Central African Republic, Namibia, North Korea and Chad (Figure 1). Levels of undernourishment can also vary greatly within countries. For example, while the proportion undernourished in Nigeria is reported to be comparatively low among developing countries, about 7 percent, much of the population residing in its northeastern region is at risk of famine. India and China also have relatively low proportions undernourished, 15 percent and 9 percent, respectively. However, due to their very large populations those two Asian countries account for a large share of the world’s undernourished population, about 40 percent or 330 million people. Other countries having tens of millions of undernourished people include Bangladesh, Ethiopia, Indonesia, Pakistan, the Philippines and Tanzania. In four countries – Nigeria, Somalia, South Sudan and Yemen – the shortages of food have become extreme with more than 20 million people facing starvation and famine. In addition, the populations of countries with insufficient data on undernourishment are believed to be facing serious food shortages, including Burundi, Democratic Republic of Congo, Libya, Sudan and Syria. More recently, crisis-stricken Venezuela is also experiencing widespread food shortages. With skyrocketing food prices, approximately 90 percent of the Venezuelans are reported not able to afford to buy enough food and close to three-fourths of them are estimated to have lost weight during the last year. Source: United Nations Food and Agriculture Organization (FAO). * Famine countries. At the other extreme of food consumption is obesity. In general, obesity is defined as excessive fat accumulation that presents a risk to ones health. A common population measure of obesity is the body mass index (BMI), which is a person’s weight (in kilograms) divided by the square of his or her height (in meters). An index of 30 or more is in most instances considered obese. Close to 11 percent of the world’s population, or approximately 780 million people, is considered obese. 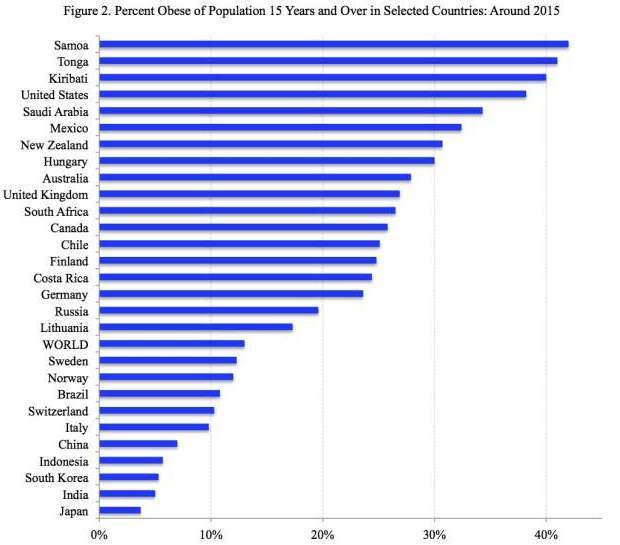 High rates of obesity, typically more than 25 percent of people aged 15 years and over, are reported for the populations of many developed countries as well as for those of some developing countries (Figure 2). The highest rates of obesity, typically no less than 40 percent of adults, are observed in the small South Pacific island nations, including Kiribati, Samoa and Tonga (Figure 2). Other countries with high obesity rates among those aged 15 years and over are: the United States (38 percent), Saudi Arabia (34), Mexico (32), New Zealand (31), Hungary (30), Australia (28), the United Kingdom (27), South Africa (27) and Canada (26). In contrast, some of the lowest rates of obesity are found among Asian populations: Japan (4 percent), India (5), South Korea (5), Indonesia (6) and China (7). The country with the largest number of obese people aged 15 years and over is the United States, at approximately 100 million. In second and third places are China (80 million) and India (50 million). Together those three countries account for 30 percent of the world’s obese population aged 15 years and over. As is the case with chronic undernourishment, obesity rates within countries vary considerably by gender, region, income and social group. In most countries, including Brazil, China, India, Indonesia, Mexico, Russia, Samoa, Saudi Arabia, South Africa, Turkey and the United States, women have markedly higher rates of obesity than men. Globally, approximately one in ten men and one in seven women are obese. 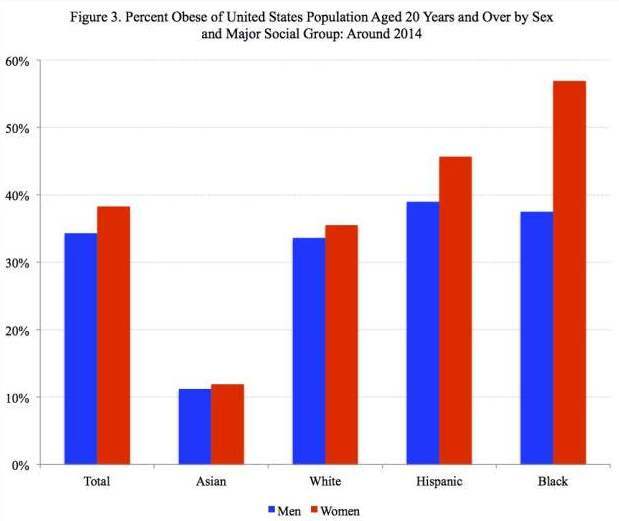 Also among major social groups, for example in the United States, obesity rates can vary significantly (Figure 3). The highest obesity rate in the US is among black Americans (48 percent), followed by Hispanic Americans (42), white Americans (35) and Asian Americans (12). Source: US Center for Disease Control. Since the obesity epidemic began, not a single country has seen a reversal of trends. While fewer than one in ten people in OECD countries were obese 1980, obesity rates have doubled or tripled in subsequent decades and are continuing to rise. Obesity levels are projected to be higher in the coming years, especially as obesity among children has increased substantially worldwide. Childhood obesity in the United States, for example, has more than tripled since the 1970s and now stands at about one in five school-aged children having obesity. Also, a recent report of European countries found that obesity rates were higher in younger adolescents than in older adolescents. Childhood obesity is considered one of the most serious public health challenges as it puts those children at greater risk of type 2 diabetes, asthma, musculoskeletal problems and future cardiovascular disease, as well as school absence, psychological difficulties and social isolation. To effectively address childhood obesity, some argue that obesity must be considered a disease. The two food extremes – chronic undernourishment and obesity – are worldwide challenges, impacting the well being of more than one-fifth of humanity. 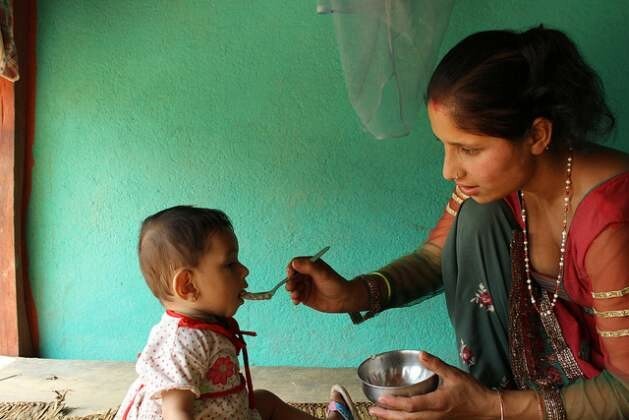 Widespread chronic undernourishment, especially in Africa and Asia, has resulted in increased levels of misery, child wasting/stunting, morbidity and premature mortality. Many have concluded that the current food shortages encompassing approximately one billion people constitute the largest humanitarian crisis since the end of World War II. Also, as the obesity epidemic continues to spread globally, growing numbers of men, women and children are facing increased health risks, including cardiovascular disease (mainly heart disease and stroke), type 2 diabetes, high blood pressure, musculoskeletal disorders, breathing problems and some cancers, often resulting in substantial disability and premature death. In addition to the serious health consequences, obesity has substantial economic costs, including medical care, job absenteeism, lower productivity and disability. Certainly, a great deal has been said, written and actions taken concerning chronic undernourishment and obesity. Numerous local, national and international organizations are focused on these two food challenges, having adopted various policies, recommendations and goals and established relevant programs to address the issues. In particular, the international community of nations has made commitments to eliminate hunger, achieve food security and improved nutrition by 2030 and also to promote and protect health through nutritious diet, healthy eating and increased physical activity. Nevertheless, despite the expressed concerns, laudable goals, increased expenditures and commendable efforts, two critical questions concerning undernourishment and obesity remain largely unanswered. What to do when millions of people not able to grow or buy sufficient food become chronically undernourished? What to do when millions of people put on so much weight that they become obese? Until those two fundamental questions are effectively resolved, the global food extremes of chronic undernourishment and obesity are likely to persist well into the foreseeable future.